I. Definition: Corns and calluses develop from an accumulation of dead skin cells that harden and thicken over an area on the foot. This is the body’s reaction to protect the foot against excessive pressure and friction. Corns penetrate deep into the skin and contain a cone-shaped core whose point can press on a bone below, causing extreme pain. Calluses develop over a wider area of the foot and remain closer to the surface of the skin. Corns usually occur on the tops, sides, and tips of toes, whereas calluses usually form on the ball of the foot, heel, and the inside of the big toe. Corns and calluses can become inflamed due to constant friction and pressure from footwear. II. 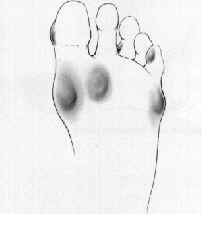 Cause: Corns and calluses are formed when there is excessive pressure on a particular area of the foot. This is often due to wearing shoes that are tight-fitting, high-heeled, or too large so that the foot has room to slide back and forth within the shoe. Tight fittingstockings or socks can also cause corns and calluses. In some cases, a foot deformity (such as hammertoe or other conditions), flat feet, high arched feet, or the loss of the fat pad on the bottom of the foot can cause points of pressure that lead to corns or calluses. III. Treatment and Prevention: Wearing properly fitted footwear is the first step to corn and callus prevention. Shoes should not be too tight, nor too loose, and have a wide toe box. If a corn or callus does develop, there are a number of steps you can take for treatment. • Soak the affected area regularly in warm water. Use a pumice stone or callus file to soften and reduce the size of the corn or callus. • Wear a donut-shaped foam pad over the corn/callus to help relieve pressure. • Your health care professional may trim the corn or callus by shaving of the dead layers of skin with a scalpel. This may restore the normal contour of the skin, reducing pressure and pain. This technique should only be done by a trained professional. • In some cases, minor surgery is necessary to remove a bony prominence that causes the corn or callus. • If the corn or callus is caused by an underlying foot abnormality, such as hammertoe, correcting the deformity is the most effective treatment. • Calluses between toes or on the tips of toes can be reduced by wearing special padding or devices that separate the toes. • A callus gets too thick for self management. • The patient suffers from poor eyesight which interferes with careful self management. • Signs of infection appear, such as redness or pus drainage.